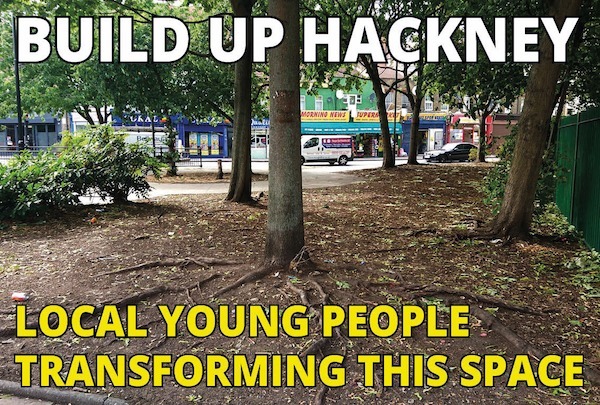 Build Up Hackney will put a team of local young people in charge of designing and building a community space a Flanders Way, Hackney (at the junction of Morning Lane and Wick Road, E9 5AQ). Young people from Berger Primary School, Cardinal Pole Secondary School and Hackney Quest will lead the project, with the support of Build Up (a specialist youth construction charity) and Hackney Quest’s (a local youth & community charity) staff. The project will help challenge negative stereotypes of young people, bring together young people of different ages, improve a neglected public space, and give young people genuine power over change in their local community. Build Up Hackney has been set up in response to the Hackney Wick Through Young Eyes report. Hackney Quest spoke to over 400 young people about their experiences growing up in Hackney. Read the full report here. Build Up Hackney has been made possible thanks to crowd-funded donations by local people, Wick Award (a local community development organisation run by local residents), and the Mayor of London.